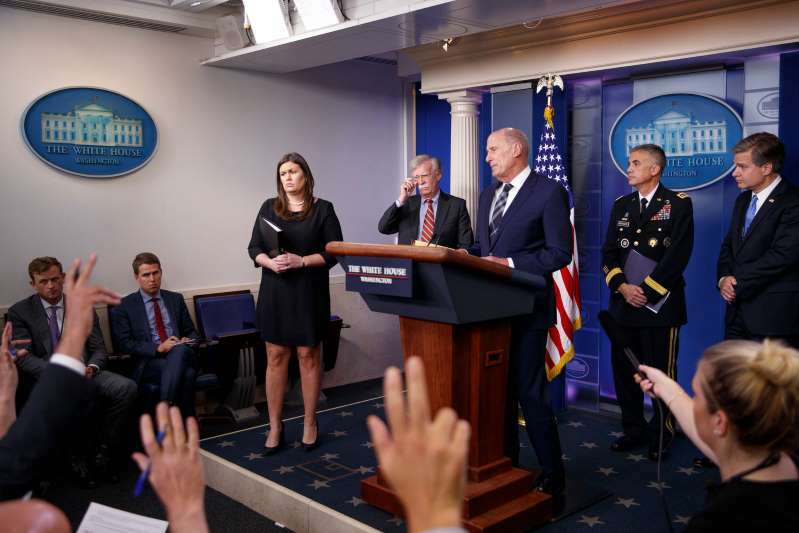 The president’s press secretary, Sarah Huckabee Sanders, and top national security officials at the White House press briefing room on Thursday. There is Mr. Trump’s foreign policy, and then there is the foreign policy of the rest of the Trump administration, backed by the Republican Party. This week, the two were openly at odds with each other. Be it Russia, NATO, Iran or North Korea, Mr. Trump’s staff and his party projected a radically different message than the president himself. Nowhere were these differences more jarring than in how the Trump administration and Republicans responded to the latest concerns that the Russian government is plotting to interfere in the midterm elections much as it did during the 2016 presidential election. On Thursday, the White House produced an array of top officials to dramatize the threat and explain the nation’s countermeasures. The president was conspicuously absent. “Our democracy itself is in the cross hairs,” said the secretary of homeland security, Kirstjen Nielsen. “It goes beyond the elections,” said the director of national intelligence, Dan Coats. “This is a threat we need to take extremely seriously,” said the F.B.I. director, Christopher Wray. The bill also strikes at Russia’s efforts to fracture the North Atlantic Treaty Organization, requiring a two-thirds vote of the Senate for the United States to withdraw from the alliance. That language is a direct rebuke to Mr. Trump, who regularly derides the alliance as a collection of deadbeats, with no benefit to the United States. Yet at a rally in Pennsylvania hours later, Mr. Trump dismissed the special counsel’s investigation of Russian interference as a “hoax” that was impeding his efforts to nurture a constructive relationship with the Russian president. “I got along great with Putin,” he said of their recent meeting in Helsinki, Finland. As for NATO’s members, he said, they were delinquent and in need of a stern lecture about paying their bills. Administration officials said Mr. Trump directed his national security team to hold the briefing on Thursday to underline how seriously he takes the threat of election interference. They said his softer language — whether about Russia or North Korea — merely reflects his conviction that he should cultivate a positive relationship with the leaders of those countries. Cozying up to Iran or Russia does not play well with mainstream Republicans, so it is perhaps little surprise that Mr. Pompeo, a former Tea Party congressman from Kansas, would stake out a hawkish position on both countries. Ms. Haley, a former Republican governor of South Carolina whose name is often floated for national office, seized on reports Friday that Russia had given work permits to laborers from North Korea — something that it denies, but if true, would violate United Nations resolutions. Administration officials have long argued that foreign leaders should focus on the policies, not the president’s Twitter posts or offhand statements. The Treasury Department on Friday, for example, blacklisted a Russian bank accused of processing millions of dollars in transactions for North Korean businesses, in violation of United Nations sanctions — one of dozens of such measures against both countries. [post_ads]But those incremental steps tend to pale next to Mr. Trump’s breakthrough moves. Even if his aides are consistently hawkish on Russia or North Korea, Mr. Trump’s solicitous approach in Helsinki with Mr. Putin or in Singapore, where he met Mr. Kim, sets the tone. After Singapore, Mr. Trump declared that he and Mr. Kim had solved the North Korean nuclear crisis — an assessment he has not abandoned even after intelligence reports that the country was still producing nuclear fuel and building ballistic missiles. This has put Mr. Pompeo, the president’s chief negotiator with North Korea, in a devilish position. He told reporters Friday that North Korea’s latest moves violated its United Nations obligations and underscored how difficult it will be to rid the country of its nuclear weapons. World - U.S. Daily News: There’s Trump’s Foreign Policy and Then There’s His Administration’s.